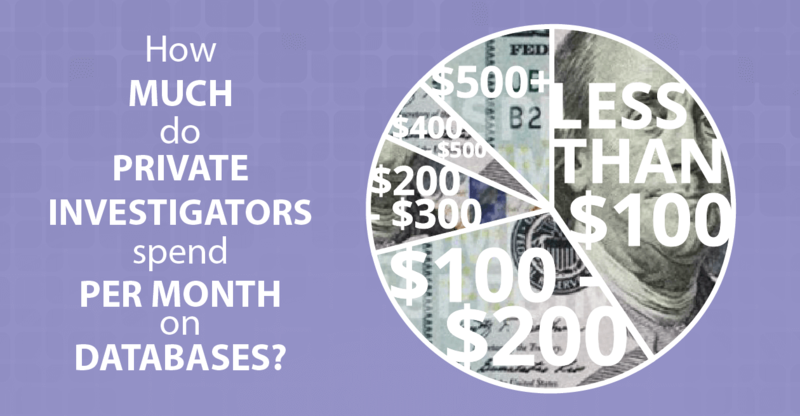 We recently conducted a survey of over 400 private investigators to better understand which databases they prefer to use, how many they are subscribed to, and what the average private investigator pays per month for these services. Which Databases Do Private Investigators Use? 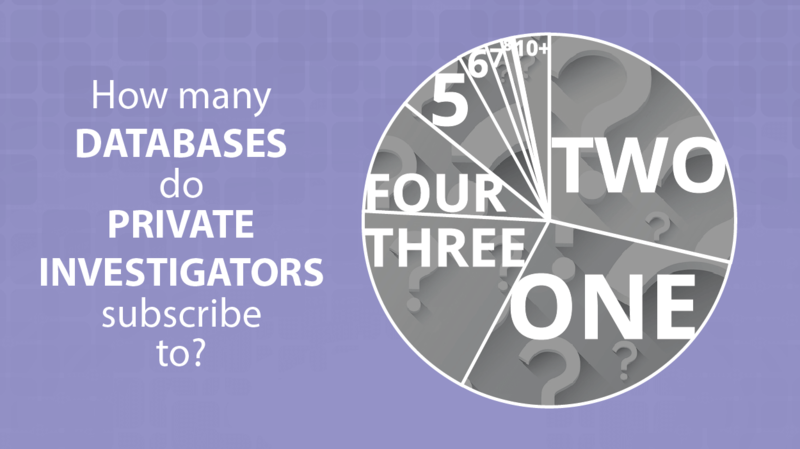 How Many Databases Do Private Investigators Use? How Much Do Investigators Spend on Databases? 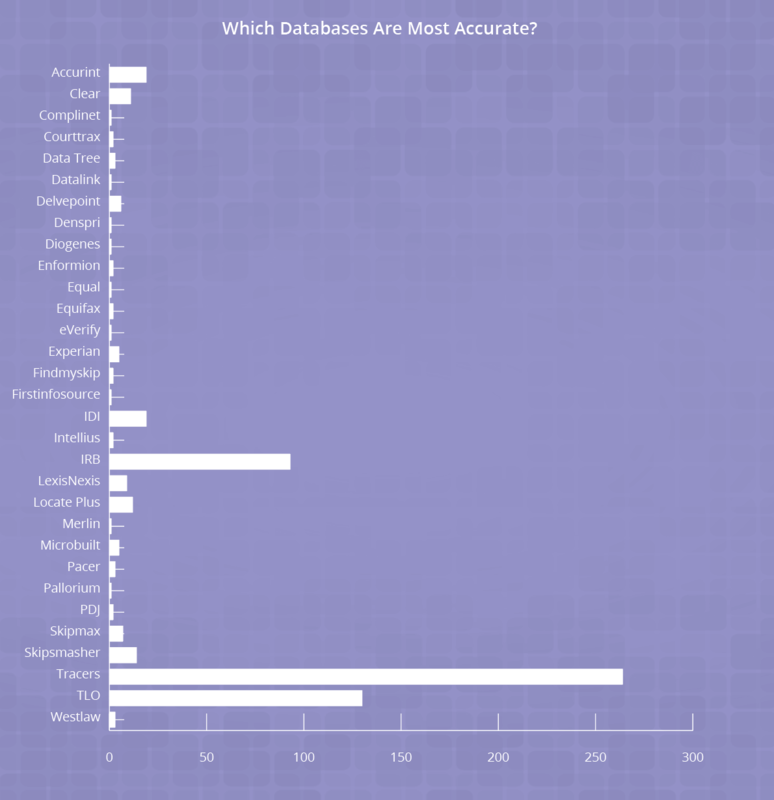 Which Databases are the Most Accurate? 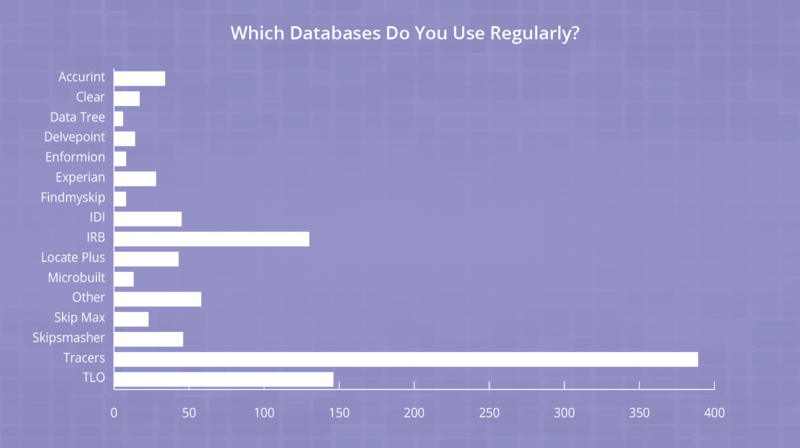 Investigators in our survey of 450 investigators said the Top 3 most accurate databases are Tracers, TLO, and IRB. Investigators listed the database(s) they found most accurate, and were able to list more than one. In a discussion about databases separate of our survey, investigators shared their perspective on which databases they use and why. "We've been using idiData a lot lately, and we have been pleased with the accuracy of their people searches and phone numbers. We also use IRB Search and are looking for another one. We got rid of TLO because we felt the data had gone down hill." "Experian, Findmyskip, Delvepoint and IRBsearch and SkipSmasher are my main go-to databases right now. Why? These produce the best results and are consistent with a 90% hit rate for my Texas skips." "I use IRBSearch, Delvepoint, IDI, and Enformion. They all work well. IDI is great for skip tracing. I found out about Delvepoint after Valerie McGilvrey wrote about it in either a forum or blog (I forget what one). Just trying Enformion, it seems to be ok, nothing special about it. I quit using TLO months ago. Not really worth the headache anymore." "I agree with all the above as I have used them with a degree of success. In all fairness, I have not used IDI as yet but it is on my check-out list. As to Enformion, I find they have an exceptional product with more searches being added in the future. The CS is hands down the best support I have seen to date which to me is just as important as the data they provide. Certainly in my "go-to" data provider." "I use IRB and Tracers. Between the two I have been able to find what I need. Another data source for real estate is DataTree." "I use Tracers and IRB. Always use two sources to check accuracy. Any investigators knows to verify any information by two means. Using two commercials databases is not a two step verification, but may be your only option. Tracers gives me full DOB and SSN up front. Both are set up with a credit card for auto billing. Saves me time. One of them has a small monthly fee I don't like, but it is no big deal." "TLO and Accurint. I've used them side-by-side on all my cases for several years. I have to say that Accurint is a very distant second place as far as the freshness of their locate information. I almost never find locate information in Accurint that isn't in TLO, and TLO almost always has information that is fresher and/or isn't in Accurint at all. Lexis Nexis needs to give Accurint some serious upgrades." "I use IRB for the majority of the time as it seems to be the most consistent. I have an associate who uses CLEAR which i have become very impressed with. CLEAR has pulled info not located in IRB or TLO. Depending on the amount of searches you do per month would depend on which one offers the best bang for the buck. IRB is a pay as you go but clear is a monthly fee of around $1200 i think. Plus you can add other options to CLEAR. You can also get three user accounts for that price if I'm not mistaken." "I use IRB, TLO, and am trying IDI, which is new. Each has its strengths and weaknesses but among the three, I usually get what I need." "Tracers for the social/dob, TLO for the good stuff!" "TLO is good but would be even better if they provided the search scope to show the parameters of the results (date ranges covered, jurisdictions searched, etc.)." "I prefer IRB. I like their billing, their results, their consistency, and you get full SSN." "I use IRB, TLO, and Tracers. All three every case. They all have some information that the other databases don't. I think TLO has more accurate phone numbers and email addresses, and IRB's locate/address updates are more up to date." "TLO, IRB, and Accurint/Lexis. Each seems to have their strong and weak points, but I think TLO is the beefiest." "We use the larger ones like TLO and IRB, but there are some smaller agencies out there that specialize in various sectors such as transportation, financial, etc." 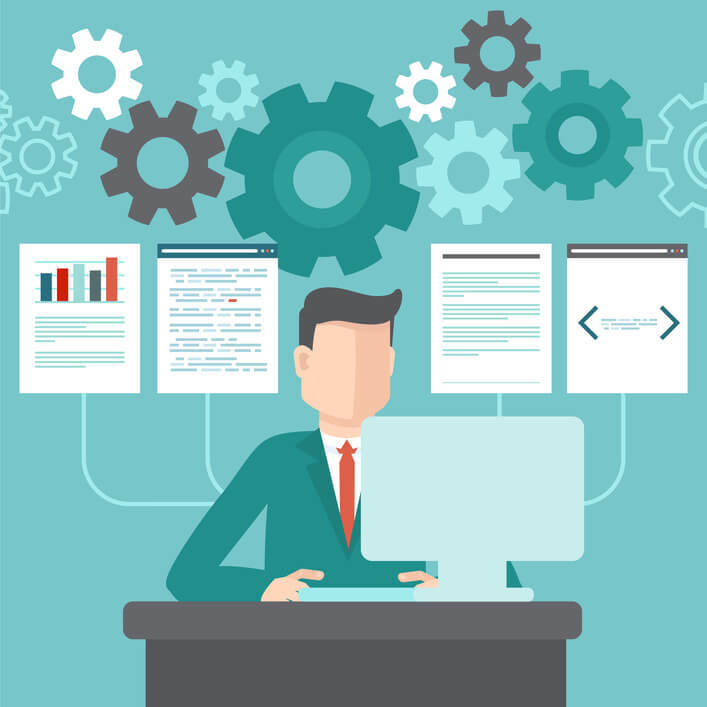 "Sometimes when people look for people and assets they rely heavily on the available databases. Please understand that these databases, while helpful, do not always yield the final result that you need to solve your case. Start first with the databases such as, TLO, IRB, Microbuilt, Tracers, Skip Max and Locate Plus." "The main players we all know are TLO, IRB, and Tracers. TLO is poor for asset searches, missing vessels, aircraft and more. TLO has a nice layout, the GUI is easy to navigate. I know many of them over there, but their customer service is far better than IRB. IRB might be a little more accurate in skips and it has more data, e.g. asset info."